Ready to measure - LEM LF 310-S Sensorpackage | CSM Products, Inc.
Plug&Play sensor package with cabling for highly dynamic current measurement in 12 V and 48 V on-board supply systems. Assistance systems support the driver and assure safety in the latest generation of automobiles. Infotainment systems entertain passengers during car journeys and provide navigation. Seats are no longer adjusted manually, and doors are opened and closed with electric motors. The ever increasing electrification is driven by many other factors besides convenience and safety though. Optimization of consumption and emissions reduction always pose new challenges for drivetrain development. Given that the 12 V power supply is not fit for purpose anymore for these more complex and more powerful systems and controllers, furthersolutions are needed. An additional 48 V supply offers clear benefits here. It has sufficient energy reserves to power former mechanical functional elements electrically. In addition, greater power can be efficiently transmitted by 48-volt technology: this allows four times the power to be transmitted with the same current and the reduced cable diameter means weight savings. Thanks to the 48 V system, a start-stop system can be upgraded to a mild hybrid system with recuperation, boosting and sailing. The result is a significant reduction in fuel consumption and emissions in city driving. 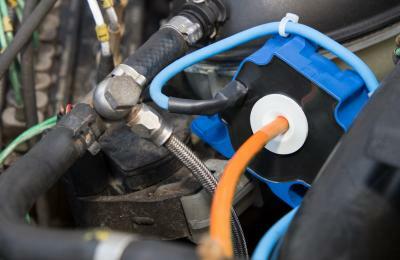 Current and voltage spikes can always occur in on-board power supplies, e.g., due to a sudden interruption of current in an electronics module, where the vehicle voltage can temporarily rise to a multiple of the nominal voltage. The duration of such a voltage spike is typically only a few fractions of a millisecond, but this is still enough to damage electronic components in the vehicle. To avoid these issues and to ensure that a 12 and 48 V power system operate in parallel glitch-free, precise measurements are needed to record the current and voltage characteristics of all electrical components. 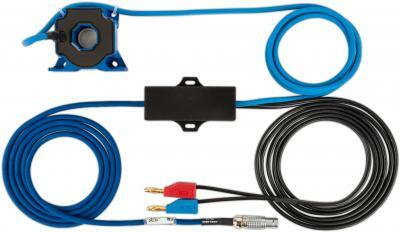 CSM has developed a sensor package that performs fast and synchronous current measurements. Highly dynamic current measurements (e.g., on all three phases on the inverter, as well) with a cut-off frequency of 100 kHz in a measurement range of ±500 A can be carried out with this fully-wired sensor module along with the EtherCAT®-based CSM measurement module ECAT ADMM 4 HS800. CSM LEM LF 310-S Sensorpackage application example. Besides current measurement, the power input and efficiency of individual components and their response over time are also critically important. Voltages at drive and power-supply components can be directly measured up to a ±90 V measurement range with the CSM ECAT ADMM 4 HS800 measurement module, as well. A synchronous measurement of all channels can be performed with the synchronization mechanism Distributed Clocks supported by the ECAT module – this is a must for power measurements. At the heart of the system is a special Hall sensor from LEM. This sensor chosen by CSM has a high cut-off frequency and it operates very accurately in a large temperature range. Sensors with this power rating require an individually adapted auxiliary supply. This is where CSM comes to the aid of customers. The sensor system is pre-wired, the customer can install it with plug&play and it’s ready to go straightaway. The sensor has a DC/DC converter and a suitable integrated shunt so that an analog output proportional to the measured current is produced and the customer can be sure that the deployed sensor is operating properly. Perfect in combination with the sensor package: ECAT ADMM HS800 for measurements up to 800 kHz.